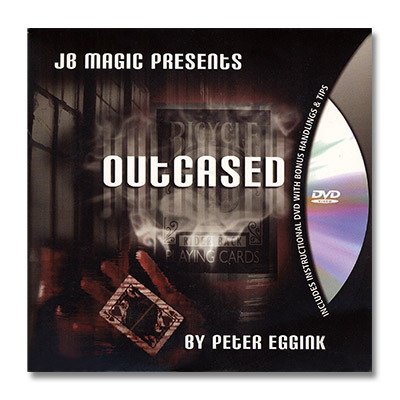 Today, when you order "Outcased by Peter Eggink and JB Magic", you'll instantly be emailed a Penguin Magic gift certificate. You can spend it on anything you like at Penguin, just like cash. Just complete your order as normal, and within seconds you'll get an email with your gift certificate. Over 6 months in design and concept! After your favourite ambitious card effect, the signed card is lost in the centre of any deck. The deck is then placed back inside its case. A rubber band is wrapped around the case width wise. The magician claims that the signed card will now penetrate the box and land outside the case under the rubberband. Just a shake and the SIGNED card VISUALLY leaps outside the box. This looks amazing. What's more with NO SWITCH or any other moves you remove the card from under the rubberband and give it back to the spectator. The construction of this prop is quite ingenious, and has received fantastic feed back from everyone who has seen this. Easy to do, instant reset. Comes complete with instructional DVD and prop. "Insanely visual, eye-poppingly magical, Peter Eggink has created a sensational ending for The Ambitious Card." "I can't imagine a better way to end an Ambitious Card routine. It's damn near perfect." "Outcased both punished and delighted my tiny little monkey brain." this is a great gimmick, that creates a real fair illusion! 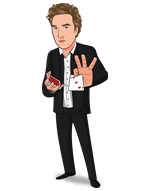 Most of the cons won't be a problem in the hands of a good magician... Its a great gimmick worth having in the magic collection. is it a worker? Depends on how bad you like the effect. I personally wouldn't use it for my full ambitious card routines this is why I give it 4 stars and not 5, for practicality. But it is a great effect overall. If you are looking for an incredibly powerful closer to your ambitious card routine, here it is. This is amazing visual magic that will literally take the breath away of your audience. In the video this is presented as a sort of stand-alone trick, but I've found it plays much better as part of a routine like ambitious card. A signed card lost in the deck, the deck put back into the case, the case is dropped onto the table or a spectator's hands, and the signed card is on the outside of the case in a rubber band...it gets them every time. You will need to practice the clean up move just a little, but it's not that hard to do. I have yet to see a spectator who reaches for the case after I extract the card. They always want to examine the card itself, which is perfect because it allows me to clean up without their knowledge. The prop will eventually wear out and you probably aren't going to be able to make one yourself, but you'll get a lot of magic out of it before it dies. Very visual and fairly easy to work with. Got mine at a different site.that had a few in stock.i love this acr ending ! Its mind numbing to a normal person. It looks so cool.watching it end on top of the packet.between a rubber band .